We improvise short and intense live performances in audio plus video using diy and circuit bended hardware. Both audio and video are generated live on stage like a jazz jam, improvising and anticipating on each other. The very nature of the a/v signal is revealed in a composition of glitch like phenomenon (live fault). Semi-random events alter the course of the performance in a organic way, interfering, creating an intense vibe. Live cinema in a pure form. Using the language of the pal signal to decifer the true signal within. A discussion through the very nature of the a/v signal. 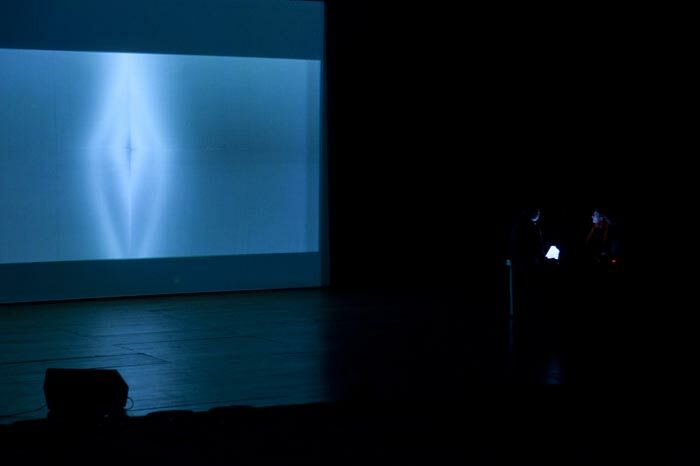 Het vleesgeworden videowoord is active in Live Cinema performances since 2005. With 4 multimedia artists (Albert van Abbe, Roel Dijcks, Wim-Jan Smits, Ties van de Ven ) we improvise short and intense live performances in audio plus video using diy and circuit bended hardware. Both audio and video are generated live on stage like a jazz jam, improvising and anticipating on each other. The very nature of the a/v signal is revealed in a composition of glitch like phenomenon (live fault). Semi-random events alter the course of the performance in a organic way, interfering, creating an intense vibe. Live cinema in a pure form. A discussion through the very nature of the a/v signal. For more information, performances, recordings and more you can visit our website.